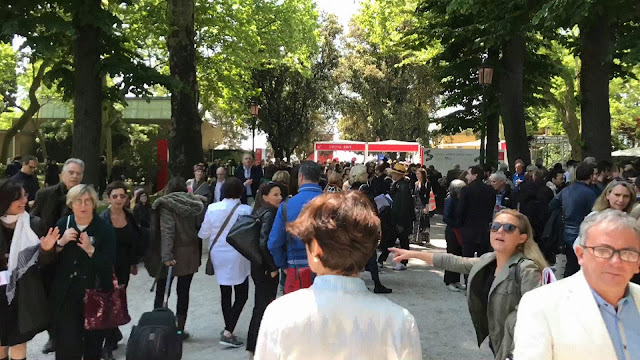 Cette édition de la Biennale di Venezia comprend environ 900 oeuvres choisies par la Commissaire Christine Macel (conservatrice en chef du Centre Pompidou) exposées dans le pavillon international, situé dans les Giardini et l'Arsenale. Aussi à voir, les quatre-vingt-huit pavillons, qui représentent autant de pays dans toute la ville ainsi qu'une multitude d'expositions collatérales. This year, the Biennale di Venezia comprises some 900 artworks chosen by Curator Christine Macel (Chief Curator at the Centre Pompidou, France) exhibited in the international Pavilion located in both the Giardini and the Arsenale. Also on view the eighty-eight National pavilions along with a multitude of collateral exhibitions spread throughout the city. In order to explore this plethora of exhibitions, pavilions and performances etc. scattered throughout the city of Venice I decide follow someone, let myself be guided by the curiosity of another. Documenting her journey via time-lapse video I attempt to capture the frenzy that such a huge event inspires to see everything and the impossibility to really take it all in.